A working artist for 35 years, Berry started his career as an illustrator before turning to painting. Initially he worked as a wildlife and landscape artist, exhibiting regularly. As he continued his career he turned his full attention to the landscape, painting Plein Air and then developing larger works back in the studio. 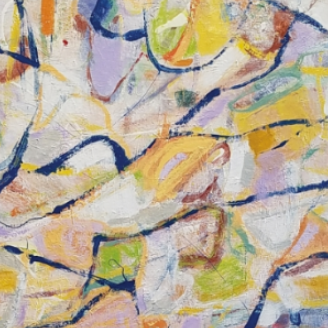 Over time his work shifted to focus on the shapes and colors of a more abstracted landscape, eventually moving entirely to pure abstraction. Berry works intuitively, channeling feelings and emotions into the painting, the result of which are bold colorful works that exude a pure expression and passion for the act of painting. Duality is the main idea behind my work. Who are we? There is so much too each one of us. Many things that are visible. Many more that are hidden. I like to think my work represents both the seen and unseen in each of our lives, the duality of our nature. Experiences molds us. DNA shapes us. We may have scars on the surface or beneath. The paths that we have tread play into whom we may become. Imperfections, beliefs and biases all contribute. Using color, pattern, line and texture my work strives to capture what it is to be human. To live with a dual nature of spirit and body, imperfections included. I use the interplay of line, pattern, shape and color to explore what it means to be human. By adding marks, covering or erasing marks, I hope to convey a sense of a life lived. Using multiple layers, some opaque some transparent, I strive to explore how each one of us is layered. Some things we want others to notice, or more importantly we try to hide what has built and formed us. Line can also be used to show pathways or changes in direction that each one of us inevitably make. By combining these design elements, choosing which ones to highlight and which to shutter, in each individual work creates a distinct and unique piece, just as we all are. This is what I hope to capture in my work, the complexities of living and making our way in a human world.